...... It allows you to watch your favorite movies on your iPod / PSP / mobile phone / laptop /PDA anytime anywhere without carrying those discs inconveniently and to protect these original discs. Much convenience than ever before ! 1) Convert DVD to AVI,DivX,XviD. 2) Convert DVD to VCD,SVCD,MPEG by custom file size. 3) Convert DVD to iPod, PSP, 3GP, Pocket PC. 4) Support choosing subtitle and Audio track to rip. 5) Support Setting Beginning and Ending point to rip. 6) Support Ripping CSS(Content Scrambling System) protected DVD movies. 7) Support Ripping region protected DVD movies. 8) Support Ripping Macrovision Protected DVD movies. 9) Support Automatically Shutdown your computer after long time conversion. We guarantee free updates and technical support. 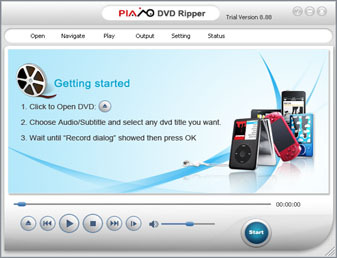 Qweas is providing links to DVD Ripper 2009.133 as a courtesy, and makes no representations regarding DVD Ripper or any other applications or any information related thereto. Any questions, complaints or claims regarding this application DVD Ripper 2009.133 must be directed to the appropriate software vendor. You may click the publisher link of DVD Ripper on the top of this page to get more details about the vendor.